Who doesn’t like raspberries? They taste great, and they are beautiful in color. There are different varieties of raspberries such as red, yellow or gold, purple and black raspberries. In fact, we previously discussed black raspberries and their reported ability to fight cancer due to their high antioxidant value and being rich in many essential vitamins and minerals. But these cancer-fighting powers are not limited to just the black raspberry. Red raspberries also contain antioxidants that may prevent inflammation (believed to be a major cause of cancer) and inhibit the growth of tumors. So it’s about time to revisit raspberries, but this time focus on the red raspberry (which, reportedly, is the most commonly consumed type of raspberry). Calcium. Recent studies suggest calcium may reduce the risk of colorectal cancer in both men and women. Maintaining the correct levels of calcium may also reduce the risk of breast cancer. And, of course, we know that calcium is imperative for building and maintaining strong, healthy bones. Magnesium. This mineral helps regulate blood pressure, contributes to bone metabolism and has antioxidant functions. Magnesium is also great for pain management. Many people use magnesium as a safe alternative to ibuprofen or acetaminophen. Magnesium may even help alleviate leg cramps women may experience during pregnancy. Phosphorus. This mineral often does not get the credit it deserves, but it does so much for your body. Phosphorus is almost as abundant in your body as calcium and helps calcium build strong bones and teeth. Phosphorus plays a role in how your body stores and uses energy, repairs cells and is needed to make proteins like the one responsible for the oxygen-carrying capabilities of our red blood cells. This mineral has also been linked to weight management. In a study of almost 40,000 women in Korea, phosphorus deficiency correlated with weight gain from oral contraceptives. Furthermore, a study from Lebanon showed that phosphorus supplements in a small group (63 people) for 12 weeks significantly decreased body weight, BMI, waist circumference and subjective appetite scores. Vitamin C Vitamin C has numerous benefits. It helps boost the immune system, prevent scurvy, promote healthy hair and collagen growth (which keeps your skin youthful and beautiful) and may help you recover faster from wounds, even wounds after surgery. Folate. Folate is essential for cell growth and many other bodily functions. To see how much folate you need, read here. Vitamin K. This vitamin plays a role in helping blood clot properly, protecting the heart, building bones and balancing insulin levels. Some reports even say vitamin K may help prevent Alzheimer’s disease. 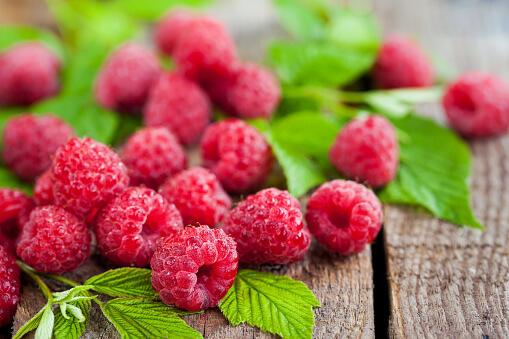 In addition to the specific nutrients identified above, red raspberries contain anthocyanins (a type of antioxidant that gives many plant-based foods their vibrant color) and polyphenols (chemicals that naturally occur in plants) which may reduce your risk for cardiovascular disease by reducing platelet buildup and lowering your blood pressure. Red raspberries may also reduce your risk for diabetes. This may be hard to believe, because red raspberries can taste so sweet and do contain some sugar (nearly 6 grams in one cup). But they are also a good source of fiber (8 grams in one cup). Fiber essentially slows the absorption of fat and sugar from food, which may help regulate blood sugar levels. Other studies which have explored the benefits of red raspberries can be found here. As always, you have to practice moderation when eating any type of food. And if you are diabetic or prediabetic, speak with your doctor about including raspberries in your diet. And probably one of the best things about raspberries is they are so easy to add to your diet. Throw them in a smoothie or a salad, or simply eat them by the handful. Or if you are having a sweet craving, try this Lemon Raspberry Sorbet. Are there any precautions we need to take with red raspberries? Overall, red raspberries appear to be very safe to eat. Due to pesticide residue, some encourage eating organic raspberries but the good outweighs the bad. It’s always best to speak with a competent healthcare professional about your diet if you have any existing medical conditions and/or are taking any medications. You always want to try to avoid a drug interaction.